This light is located on the North side of the entrance to Castine Harbor from Route 166 off Battle Ave. Grounds are open to the public. Private residence. Castine was first settled in 1614 by French fur traders, and due to its strategic location, wars broke out and it was occupied over the next sixty years at different times by the flags of the English of Plymouth Colony, France, and the Dutch. In 1676, Baron de St. Castin took possession and the town prospered due to his marriage to the daughter of the local Indian Chief, Madockawando. During the Revolution, Paul Revere led his patriots on an unsuccessful attack on the British held Fort George. In the War of 1812, the British took over the US built Fort Madison and controlled the area until the end of the war. Many opulent sea captains’ homes from the nineteenth century can be found in Castine as many clipper ships left Castine to embark on foreign trade. 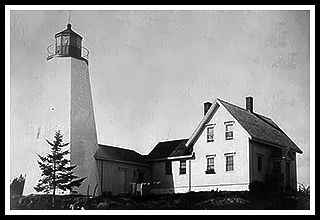 Dice Head Lighthouse was built in 1828 to guide mariners heading into the Penobscot River to the main lumber port of Bangor. When shipping in the area had decreased, a skeleton tower replaced it in 1935. 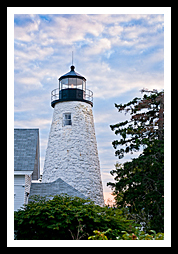 The town of Castine has maintained the Keeper’s house and property since 1937, and later the lighthouse was also turned over to the town in 1956. In 1998 the lighthouse was renovated, but in 1999 a fire broke out burning the roof and damaging the tower. The town opted to repair the structure. In 2007 a rare tornado like windstorm, called a micro burst, destroyed the skeletal tower put there in 1935. The Coast guard announced it would install a new optic in the tower to bring the lighthouse back to life after it had been discontinued in 1935. Heading down Route 175 to Route 166 off Route 1, Castine is one of the oldest towns in America, a quiet seaside village where you can tour the ruins of Fort George and Fort Madison, or visit a variety of art galleries. More than 100 historic markers can be found in this town for visitors to enjoy. Take a walk and enjoy its colorful eighteenth and nineteenth architecture or tour some of their historic museums that are operated by the Castine Historical Society, which itself is located at the Abbott School, an old restored schoolhouse. The Wilson Museum has exhibits featuring ancient farming and home equipment, and you can find an old blacksmith shop nearby. Castine’s Maine Maritime Academy allows visitors to explore the State of Maine, a 500-foot naval research ship, when docked. At Dice Head Lighthouse, you can take a brief walk along the public footpath provided to view the lighthouse and the bay below. The Bagaduce River Watershed is ideal for kayaking and canoeing. Wadsworth Cove and Backshore Beach offer gentle relaxing waters to relax. From US Route 1 in Orland, take Route 175 South to Route 166 past Fort George and the Maine Maritime Academy to Battle Ave.
Park on the side of the road when you see the light. It is now privately owned in a residential area but there is a public footpath to the left of the garage to view the lighthouse and the Penobscot River. My 300-page book (with over 360 images), Lighthouses and Coastal Attractions of Northern New England: New Hampshire, Maine, and Vermont, published by Schiffer Publishing, provides human interest stories from each of the 76 lighthouses on the northern coast, along with plenty of coastal attractions and tours near each beacon, with contact info to plan your special vacation.